out to save the world? 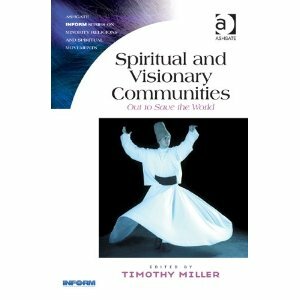 A new book has just been published: Spiritual and Visionary Communities: Out to Save the World. Having purchased it myself and read chunks of it, I can safely say that it is a throroughly readable and utterly compelling study of some of the many intentional communities around the world, a study that is nevertheless academically rigorous and backed by copious and meticulously detailed footnotes and references. Readers of this blog would be fascinated by this book as it contains a chapter about someone’s experience within the NKT. Yes, folks, you read that right: there is a book out there now that contains an account of life within the NKT, “warts ‘n all”! That alone makes this book ground-breaking and worth reading just for that. I must admit to being biased about this book: I have personal experience of INFORM, the independent charity that collects and disseminates accurate, balanced and up-to-date information about minority religious and spiritual movements, and which has organised the bringing together of the collection of essays that constitutes this book. I have had reason to be very grateful for the balanced, sensitive help and advice INFORM gave me when I experienced the trauma of becoming involved in a bitter dispute within the New Kadampa Tradition, one of the movements written about in this book. The subtitle of this book – Out to Save the World – indicates what is common to all the intentional communities that feature in this book, these communities being just a small sample of the many thousands of such communities around the world. These communities originally start off with the best of intentions, in this case the intention to help save the world in some way. But so often these communities, because they involve some radical experimentation or innovation in communal living, or represent a radical break with a spiritual tradition, or cultural norm, have crises and disputes to deal with which threaten their very existence. How these communities deal with these crises determines, amongst other things, whether the original intention of these communities survives or changes significantly, sometimes so much so that it becomes unrecognisable to the community’s original founders or members. These communities, when they function harmoniously, often help their members to experience the height of spiritual inspiration, even ecstasy, in ways not available in the ‘normal’ world, sometimes creating the feeling of having been ‘saved’ and thereby empowered to help save others. But when they go wrong, the fall-out can be toxic to all involved, especially given the deep emotional, financial and social investment members of these communities often have to make in order to gain entry to them, or at least feel like they belong within them. Exit from these communities, voluntary or enforced, is often deeply traumatic and destabilising for both the people leaving and for some of those left behind. I will only mention one essay in this book, the chapter written by Carol McQuire about her time as a Buddhist nun within the New Kadampa Tradition (NKT), which is deeply controversial within the world of Buddhism generally. I, like Carol, was once a devout member of the NKT and I was deeply moved by Carol’s searing honesty about her experiences, and about her complex and evolving feelings towards the teachers, teachings and organisational practices of the NKT both during her time as a nun and after her traumatic exit from the NKT. I could relate to many of her experiences and feelings and recognised how difficult it is to retain one’s idealism and devotion in the midst of turbulent, confusing and often disturbing change within an organisation like the NKT, which tries so hard to preserve what it perceives to be a ‘pure’ Buddhism whilst at the same time trying to put clear blue water between itself and the rest of the Tibetan Buddhist tradition that it originally evolved from and which often itself criticises the NKT as being less than a ‘pure’ Buddhist sangha. Carol’s essay was somewhat cathartic for me and helped me with my present journey towards understanding and integrating my past within the NKT. I suspect many of the other essays in the book will serve a similar function for others who have had contact with either the NKT or the other intentional communities explored in this book. All the essays in this book are meticulously backed up with copious footnotes and references to academic research and documentary material, and the introductory overview by Timothy Miller of the broad history of intentional communities is extremely useful in putting the essays that follow into context. The stories in this book are about powerful, often bizarre, always deeply felt experiences by real life people within the intentional communities they belonged to, and show a side of spiritual life that very rarely makes the headlines, especially as many communities have fraught relationships with the media and society in general, sometimes preferring not to engage openly with them at all, in order to maintain their ‘purity’ or so as to maintain their freedom to operate in the way they wish to, or simply because they despair of ever getting the wider world to understand or accept them. This book is an invaluable contribution to the study of intentional communities and their often fraught histories, complex social relationships and organisational psychologies. It is also very readable and compelling into the bargain. Truth is often stranger than fiction and this book certainly illustrates that. If you wish to study the evolution of the New Kadampa Tradition in the wider context of Tibetan Buddhism in general and within the cultural context of Buddhist adaptation generally within the modern West, you may find the academically rigorous analysis by Dr. David Kay in his “Tibetan and Zen Buddhism in Britain – Transplantation, development and adaptation” to be essential reading. This is exactly the sort of wider context that makes so much of what the NKT does more understandable. It is the sort of context that would probably never be supplied from within the NKT itself but which needs to be supplied from outside the NKT if any kind of balanced perspective upon the activities of the NKT is to be even possible. I’m not going to quote from the essay, because it is such a long one and I really think it needs careful reading all the way through to get a real understanding of the full historical background to the NKT. In the process, I think one gets a much better understanding of Tibetan Buddhism in general and of the ongoing challenges Buddhism faces in its transmission to the West. It also gives one some insight into how much the NKT itself has changed already and is likely to change even more as it tries to deal with its own turbulent past and the fast-changing dynamics of its present situation. Without reading this essay, one would probably never know – unless one has been a long-time ‘insider’ – just how much, and why, the NKT has changed, as the NKT is very good at rewriting its own history in order to promote the impression of it having an untroubled, stable and secure identity that has endured over time, free from challenge by internal conflicts or external disputes. I heartily recommend that Kay’s work be studied, especially as he bends over backward to be as fair and objective as he can. Happy reading! I had the great good fortune of engaging in another retreat day today, with a great company of fellow retreaters, and under the expert guidance of a true Kadampa practitioner, one who is, for me, infinitely more authentic, and with far greater integrity and compassion, than the vast majority of so-called Kadampa teachers within the tradition that I was once so recently part of. Once again, as on the previous retreat day I attended, I was able to engage in plenty of meditation and share my feelings about it afterwards with others in the group in a totally egalitarian, compassionate, and non-judgemental atmosphere. It felt like being in a perfect Dharma centre, one that was open, tolerant, and free from any hierarchical boundaries. There was no need for deference, no need for submission to authoritative definitions of exactly what should be done and how, only a willingness to submit to normal rules of care and consideration for others within the group in the same way as we should anywhere else in society. There was no organisation to subscribe to, no pressure on people to do anything other than participate in any way they felt comfortable with. Any volunteering that needed doing happened spontaneously and enthusiastically without any need for people-management. The warmth and kindness in the room was palpable and the conversation very focussed on the Dharma. If only it could always be like this! But, on reflection, that it was like this today is enough. For every day like today is a confirmation of what is possible, of what a Buddhist sangha can be like, of how one can feel totally at home in a community freely coming together to study and practice Dharma without trying to impose limits on one another’s expression of that Dharma. It was very liberating to be with the band of Dharma practitioners I was part of today, a band which was quietly getting on with the business of enlightenment one meditation at a time. I am rejoicing in today for all it is worth, for the memory of such a day as today will be added to all those other positive memories I have that will help to ignite and sustain the bliss of loving-kindness within my heart that will one day hopefully blaze into the full radiance of spontaneous bodhichitta. I have nothing but gratitude for all those who helped make today such a special day of refuge in the Dharma. We humans are, like all other phenomena, dependent-related phenomena, and the most important phenomena, both in terms of number and degree of dependency, are all those phenomena in the natural world, in our immediate eco-system, that we are interacting with, that we are inextricably linked with. An immediate example is the air itself, containing the vital oxygen that we breathe in continuously in order to fuel the chemical and physiological transformations within our bodies that sustain our life moment by moment. Even if one has no scientific knowledge at all, a phenomenological appreciation of the mere fact of breathing reveals one’s dependence upon the whole atmosphere around oneself, an atmosphere that appears to fill the whole of space, to be limitless, inexhaustible, and to have no boundaries, and that merely to hold one’s breath for long enough is to immediately create increasing physical distress which can only be alleviated by resuming breathing. It is no coincidence that one of the most basic meditations in Buddhism is focussing and sustaining attention upon the breathing process, which is at the core of our embodiment within the natural world that is our life-support system’. Our breathing breathes life both into our meditation and generates awareness of our dependence upon ecological phenomena for our very awareness itself. By becoming more aware of the actual process of breathing we automatically become aware of awareness itself, which co-originates with the intake of air itself. Perhaps this union of in-breathed air with awareness is behind the long association of breath with spirit, pneuma, prana. But for me, the breath is proof of the embodiment of awareness within the ‘material’ or ‘physical’ world. even though awareness feels, especially in its reflexive mode, as being ‘non-material’, as transcending the material world, or as an emergent property of the material world, as somehow a phenomenon separate from the material world. The Buddha appears to have known that the breath is such a potent gateway to a deepening of mindfulness precisely because it is such an obvious and easy gateway towards a greater awareness of the myriad of ways in which the many mutually interacting, and mutually dependent, mental and physical sensations and processes that make up the human consciousness of the world. Just by following the breath deeper into its constituent and supportive physical processes and then going further into following all the subtle mental and emotional processes that are concomitant, or associated, with the breath, one can actually traverse the entire route to enlightenment, as outlined in the sattipattana sutta. At no stage in the development of the breathing meditation could this dependence of the breath, and hence of our entire existence as a living being, upon the wider natural world, ever be forgotten, as the breath responds in every way to the condition of our environment. fresh air invigorates, stale air debilitates. breathing air in a room filled with fragrant incense and/or flowers can have a dramatic effect on the quality of meditation. Prehaps holy sites where much meditation, contemplation and prayer has gone on has air add qualities to the air that makes breathing the air there particularly powerful; not for nothing do we talk about the ‘atmosphere’ of a place or building. And, of course, we all breathe within the same atmosphere, we share the same air, so we are all connected to each other and all living beings through the air itself. By polluting the air in any way, we are harming all loving beings to some degree. And we are as humans, polluting the atmosphere in a colossal way through our collective carbon emissions with consequent colossal consequences for all living beings. A very natural way, therefore, to become more environmentally aware is simply to be more aware of our breath and its key role in all of our own life, both physical and mental, and in the life of all beings. What will 2013 bring, especially for Buddhists and Buddhism in general? I hope it brings an increased awareness amongst Buddhists about the prospect of catastrophic climate change and how Buddhists can, indeed perhaps must, get involved in what is arguably the greatest challenge mankind has ever faced: the challenge of reducing the carbon emissions of mankind sufficiently to mitigate the worst effects of global warming and allow mankind, and all other living beings, a reasonable chance of making the necessary adaptations to the inevitable climate shifts without catastrophic losses of life and eco-systems. This seems to me to be a supreme field for bodhisattva activity, as anything that helps to achieve some reduction in carbon emissions or help make the switch to a low carbon society and economy will quite literally benefit all living beings. The urgency of the global warming crisis is such that all of us, especially all of us Buddhists, acting here and now to help deal with this climate emergency, will be engaging in something that will benefit not only this generation but all future generations. This is now a chance for Buddhism to become truly engage with one of the most urgent issues of our time. Many Buddhists from traditional forms of Buddhism realise this and are urging such action, and the book, A Buddhist response to the Climate Emergency, is a tremendously powerful statement by many of the most renowned Buddhist teachers of our time for such engagement by Buddhist worldwide. By far the best website I have come across for exploring the climate emergency further and looking at ways that Buddhists can help deal with it is the Ecological Buddhism website. 2012 was the year in which I started immersing myself in environmental campaigning as part of my bodhisattva field of work, and I hope that 2013 will see a deepening of my commitment, and a widening of my range of activities, in this area. What is also clear about 2013 is that we will see an ever increasing engagement of Buddhism, especially the more recent and secularised forms of it, with the cutting edge of modern developments in science, technology and cultural innovations generally. Nowhere is this more evident than in the field of computing and the internet. What impresses me is the sheer range and variety of Buddhist websites, and the ever increasing sophistication of those websites. Truly the internet is now contributing significantly to a vast and deep transmission of the Dharma on a global scale and in a myriad of new ways. The challenge is how to marry the advantages of online educational technology for structured, easily accessible learning courses that have built-in interactivity and supported by media resources of all kinds with the advantages of the traditional fac-to-face oral transmissions and the supportive aspects of having a local sangha. Some Buddhist websites are making great progress in this area, but as usual there is much work still to do to fully exploit the potential of the internet for deepening Dharma study and practice. And, of course, there are dangers with an online approach to Dharma, dangers that require the use of mindfulness to keep them in check. But then again, these dangers are themselves an opportunity to deepen that very same mindfulness. I suspect that the use of the internet to spread the Dharma is just as big a challenge to traditional ways of Dharma transmission as the transfer of the original purely oral teachings of Buddha into a written form, and later on the mass production of the originally hand-written texts through the use of printing, an innovation that enabled the Dharma to spread quickly throughout the vastness of China. A good summary of some of the key issues concerning Buddhism and the internet is Sean Healey’s article. And by online, I mean not just desktop computers but also mobile phones and tablets. The proliferation of Buddhist apps for such devices may represent a quantum leap for the uptake of Buddhist ideas and practices on a mass level, if such apps gain traction and popularity. The development of such apps is very much discussed in detail by the techno-savvy guys at Buddhist Geeks. But perhaps the most significant, if less obvious, way in which Buddhism may evolve in 2013 is through a subtle deepening of the engagement of traditional Buddhism with modern psychological research and practice. This has been going on for some years now and will no doubt continue. Buddhism is arguably a psychological world-view in itself, and certainly modern psychologists have recognised in Buddhism a rich source of ideas about human psychology. Modern psychology has a huge if often unacknowledged influence upon modern ways of thinking about the mind and thinking in general, so any engagement of Buddhism with modern psychology gives Buddhism a chance to exert a wider influence upon society in general, although in the process Buddhism itself undeniably starts to become influenced by modern psychology itself. Certainly Buddhism has been mined by modern psychologists for ideas about how to introduce mindfulness training into health care settings, and this secular application of Buddhist principles is making substantial headway in clinical psychology, certainly in the US and the UK, and is a fascinating story in itself, as described very well by Vishvapani in his excellent blog on Buddhist issues. I would argue that the best Buddhist websites attempt to combine the best of online educational technology, itself heavily influenced by modern educational psychology research, with the most important aspects of Buddhist psychology to create new and innovative ways of transmitting the Dharma. But that is another fascinating story in itself. And I would argue that the best of the newly emergent sanghas are those which recognise that traditional forms of Buddhism cannot be harmoniously transplanted to the West without an awareness of the particular psychological make-up of people within Western culture and the particular needs many people attracted to Dharma have of either psychotherapy of some kind or some help to understand what a basic positive psychological state is before they engage too deeply with advanced Buddhist practices. That is why I would recommend to all Buddhist practitioners works such as Toward a Psychology of Awakening by John Welwood and The Psychology of Buddhist Tantra by Rob Preece. Both Welwood and Preece are Buddhist practitioners of long-standing but are also qualified psychotherapists of long-standing, and their works point out the dangers of an uncritical acceptance of the psychological and emotional demands of certain traditional Buddhist principles and practices, dangers which can be avoided or overcome through a sensitive application of Western, non-Buddhists psychological and psychotherapeutic principles. I myself wish I had read these books before I had engaged too deeply with the New Kadampa Tradition of Buddhism, as these works enlighten me on some of the mistakes that both I and the management of the NKT have made with respect to managing conflict within the NKT centre I belonged to and the wider NKT in general. But such mistakes are not confined to the NKT. Many other Buddhist traditions have had similar traumatic lessons in conflict management, and many will continue to do so as long as the resources already within our culture for helping to deal with them are ignored or demeaned by those traditions because of a lack of humility about the limitations of traditional forms of Buddhist practice or Buddhist governance. Anyway, we’ll see what 2013 brings. May you all have a very Happy New Year, filled with much peace and joy! He who is attached to anything, even to liberation, is not interested in the Dharma but in the taint of desire… The Dharma is not a secure refuge. He who enjoys a secure refuge is not interested in the Dharma but is interested in a secure refuge…. The Dharma is not a society. He who seeks to associate through the Dharma is not interested in the Dharma, but is interested in association. Similarly the Zen master Sengchen warned: “Do not search after the truth; only cease to cherish opinions.” Buddhism is a religion of ehi-passika, come and see, come and experiment for yourself. Many Buddhist organisations do sustain quite ambitious projects (like Samye-Ling’s Holy Island initiative) but none can equal the ambitiousness of the three movements [SGI-UK, FWBO, and NKT] — busy making new members, servicing the existing membership with professionally managed programmes to suit each grade, training teachers and middle managers, maintaining impressive publishing programmes, handling PR and promotion, mounting cultural and charitable projects, and even running “Right Livelihood” businesses (in the case of the FWBO). All this busyness arguably implies an imbalance between the traditional Buddhist virtues of virya (energy, forcefulness) and ksanti (spiritually creative humility and acceptance) — and, in the case of the FWBO, between “True Individuality” and anatta (no-self). Contemporary society already suffers from too much unreflective virya, and Buddhists-with-attitude sell it short in moving too far from the religion’s contemplative tradition. Surely the Fast Lane and the Middle Way are ultimately incompatible? A more tangible cause of unease is that even if they were not as exclusivist as they are, the dominance of three such movements would be unhealthy for UK Buddhism. In the spirit of the Kalama Sutta free, personal, experiential search lies at the heart of Buddhism. Teacher and sangha exist to provide support and guidance, but that is all, and the ultimate guidance of the best teachers is to throw searchers back upon themselves, undercutting every successive clinging attachment — even to Buddhism or the teacher — or the movement… This is inner path religion. There is always the danger that the supportive institutional framework of community, doctrine and teacher will seduce searchers and become the end rather than the means, in this case filling their existential sense of “lack” with all the exhilarating righteousness of a missionary movement. That is the outer path, so easily confused with the other path. To make ideological movements out of Buddhist organisations is thus ultimately adhammic.